I have to admit, I was totally, totally against the idea of purchasing an air fryer. And not just a little bit against it, but really, really against it. I figured an air fryer was going to be another small appliance we rarely used. Who else has lots of those? And not only did I think we were not going to use it, I especially did not want another “thing” on my kitchen counter. Extra stuff on my kitchen counters is really one of my pet peeves. I really despise anything being dumped on them, whether it’s mail, car keys, computers…take them to your room and keep them there! But that’s a rant for another day. Anyway, I really did not want this new appliance and felt it was going to be a waste of money. However, my husband kept insisting on getting one and he finally just pulled the plug and ordered it even though I was not feeling it. I’m so glad he did not listen to me. Air Fryers are really kind of ugly and this one kind of reminds me of Darth Vadar’s head/mask thing, but oh my gosh, it’s the best appliance ever. Yes they are worth it! There are lots of air fryers out there, but I do particularly love my air fryer. In fact, here are the best-rated large capacity air fryers available and mine is always among them. If you can grab this air fryer for under $150, you are getting a great deal. In fact, you can read the 5-star reviews on this air fryer here. In the air fryer, everything comes out crispier, juicier and always perfectly cooked in an incredibly short amount of time. Tatar tots in the air fryer are the best. Chicken in the air fryer, breaded or not is so juicy, tender and delicious. Even ribeye steaks are awesome in the air fryer and I can’t even believe I was willing to try that. Anyway, you get it, it’s worth every penny. There is no preheating time and the cleanup is very minimal. The air fryer locks in all the juices so you barely have any mess to cleanup. It even makes the perfect crostini toast. I would not recommend an air fryer smaller than a 5.3 quart, it would just be too limiting. Look at that beautiful flaking of the salmon after being in the air fryer, it’s absolutely perfect. So, yes, they really do work in producing the best tasting food. 1-1/2-inch fillets. And they were out of the fridge for about an hour to warm them up. Since my boys fish for salmon every summer, all of our salmon is wild caught and still has the bones. I find the bones are easily removed with needle nose pliers since they do not tear apart the fish. Here are the salmon fillets in the air fryer basket. It’s best not to crowd things too much. All you have to do is place the salmon fillets in the air fryer basket and turn on your air fryer for the appropriate amount of time. It’s that easy! You can see how beautiful the color is when they are finished, not to mention extremely juicy and tender. Salmon has been on the menu a lot more since I started making it this way. When you reheat food that’s been cooked in an air fryer, it remains juicy and tender, as if the juices were locked in…it is amazing. If you’ve been waiting to get an air fryer, I hope this propels you to make it happen. Please check out my other air fryer recipes here. There are so many things you can make in an air fryer, in fact, the possibilities are endless. I know my kid’s would love these Air Fryer Chicken Nuggets. And who wouldn’t love a batch of these Air Fryer Spicy Sweet Potato Fries? And who would have thought Air Fryer Roasted Corn would turn out so perfect. And holy wow these Copycat Taco Bell Air Fryer Crunch Wraps sound over the top. But these Air Fryer Reuben Egg Rolls also sound crazy addictive along with this Air Fryer Chicken recipe that uses buffalo sauce! One year ago I shared my Grapefruit Cranberry Martini with you, have you made it yet? Five years ago this quick dinner of Loaded Sausage and Gravy Baked Potatoes came into my life and is still a quick dinner for us. Seven years ago I learned to make Chicago-Style Hot Dogs at home and shared them with you. Eight years ago these Cornmeal-Blueberry Scones made me feel like spring in the middle of winter. And nine years ago this Asparagus Popover won me over. 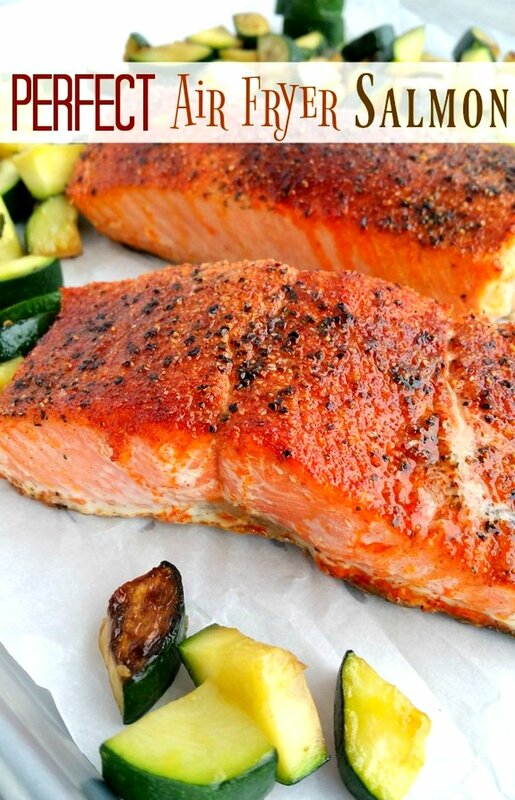 Remove any bones from your salmon if necessary and let fish sit on the counter for an hour. Rub each fillet with olive oil and season with paprika, salt and pepper. Place fillets in the basket of the air fryer. 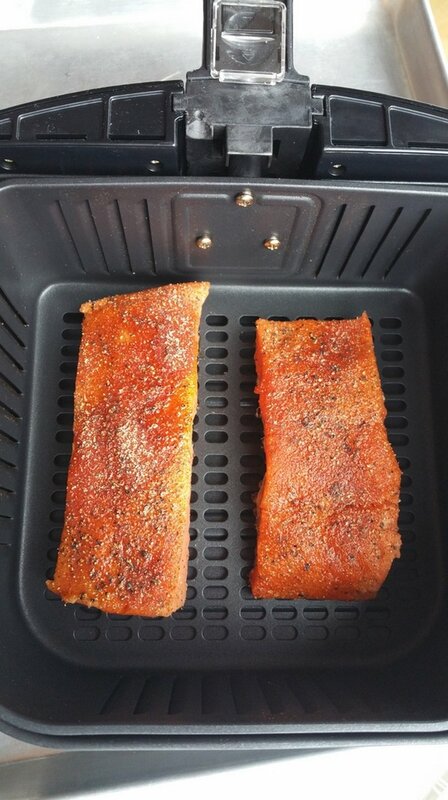 Set air fryer at 390 degrees for 7 minutes for 1-1/2-inch fillets. When timer goes off, open basket and check fillets with a fork to make sure they are done to your desired doneness. Notes: One of the beauties of the air fryer is that it's so easy to pop something back in for a minute if you want it cooked longer. You can also open it while it's cooking to make sure it's not overdone. I always set my timer for a little less so I can check on how things are coming along so I don't overcook an item. Things cook so fast sometimes a minute more is all it needs. 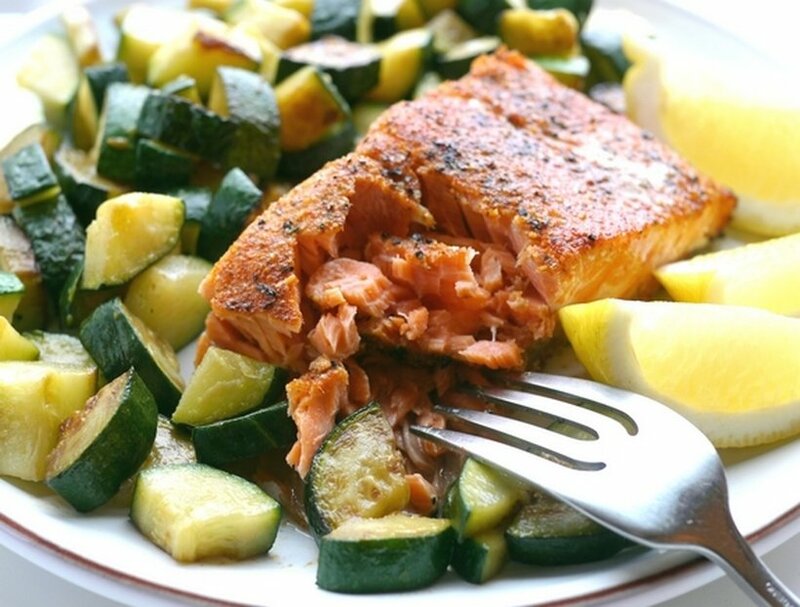 Times for cooking will vary for salmon based on the temperature of the fish and the size of your fillets. Always set your air fryer for a little less time than you think until you become more used to the timing of your appliance. Before you know it you’ll be buying a sous vide stick! (But they’re small and you can put it in a drawer) It’s my new favorite gadget. Easy to use and perfect results. It’s the only way I’ll poach eggs anymore! I have one! However, the air fryer is so fast and works with a lot more foods than the sous vide stick. I cannot say enough good things about the air fryer. I’m going to try the salmon. We’ve been using our air fryer to cook chicken wings. No breading or deep frying. Healthy. Cook on 390 for 25 min; take out and pour any sauce you like. Put back in to crisp up about 3 to 5 min more. Delicious. We’ve made 20 in a 6 qt fryer. Great for a party. I’ve found my favorite wings are Instant pot for 10 minutes with immediate quick release. Then 10/15 min in the AirFryer at 350 or so to crisp. The IP makes them stay really juicy. Oh my goodness. Turned out fantastic!! My sis and I used smoky paprika. I love my Air fryer!! Such a good idea; I am definitely going to try it! Thanks for the shout-out for my sweet potato fries! I also cooked the sweet potato fries! This meal was amazing! Love my AirbFryer. Best Christmas present ever! It is honestly the best thing ever. I bought my wife one. She and I both love cooking with it. Everything from pork chops, steaks, grilled shrimp, cod, salmon. All come out great. Fun in the kitchen experimenting together. We got the xl capacity Secura from Amazon. Love it !!! I can’t wait to try this salmon. Tried this recipe tonight for the first time and it was awesome! So quick and also moist and delicious! Didn’t want to heat up the house by turning on the oven and now I’ll always make salmon in the air fryer to save time and enjoy the benefits! So glad to hear it. The air fryer is perfect for summer! There is a link in this post to my air fryer. Hello, I’ve sent off for your email recipes, one reason is my Pinterest no longer has the ability to save recipes, I don’t know why, but I’m looking forward to your email. I bought steel cut salmon at Costco and decided to try your recipe. It was so easy and DELICIOUS.. I would definitely try this for company. I am so happy I have an Air Fryer. do you preheat your air fryer before you put the salmon in or do you turn it on once the salmon is inside? Does an air fryer brown the food? Can you put frozen salmon filets in it? Hmmm…I mean you could, but I have no idea how long to cook them for. You’ll have to experiment. However, I think you’ll have better luck with thawed. Just tried this awesome recipe!!! Thank you so much it was delicious! It’s definitely the best! Glad you liked it. I know you mention removing bones, but I did not see if the skins should be removed too. Do you keep the skin on or off for this? I keep the skin on and the fish slides right off the skin once cooked. Most salmon sold in stores have the bones removed. We fish for our own salmon here in the Pacific Northwest so bone removal is on us. Does the fish smell up the house when cooking in the air fryer? It smells pretty pungent when I bake it in the oven. Thanks! My house never smells fishy, even when baking. I think if your fish has a really fishy smell while raw, that could continue during the cooking process. With the air fryer I never notice a smell. If cooking something smelly in the air fryer, like fish or even brussels spouts, you can put a cookie sheet on top of your stove and place your fryer on that, and use the air fryer with your vent fan on. 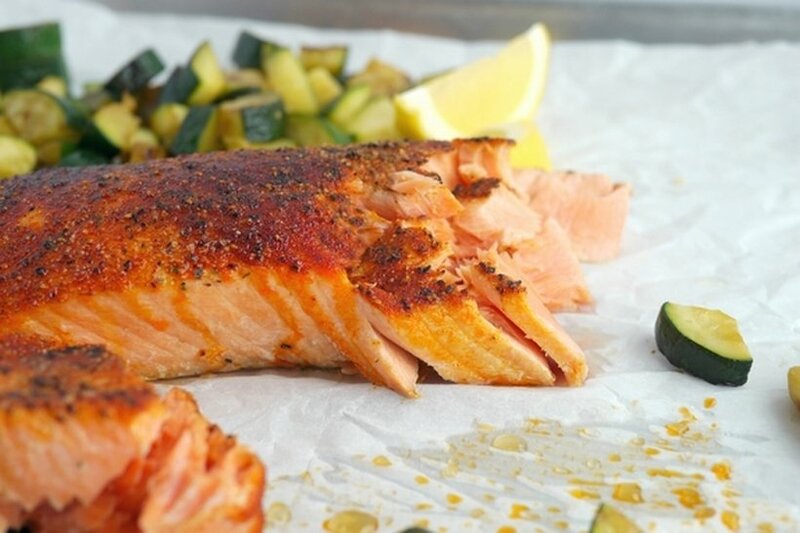 Can I cook salmon on a cedar plank in my air fryer? Hmmm, I don’t really know. But I would not want to block any of the air blowing around my salmon in the air fryer. 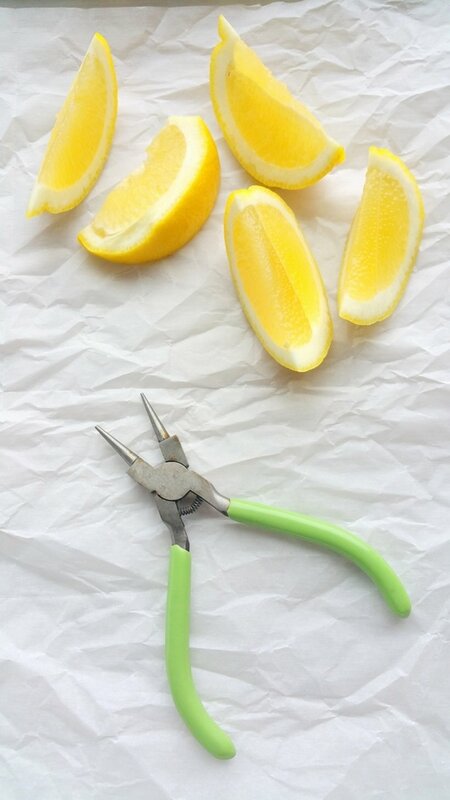 When do you use the lemon wedges in your recipe? I squeeze lemon on the salmon before serving, but it’s not necessary if you don’t want it. 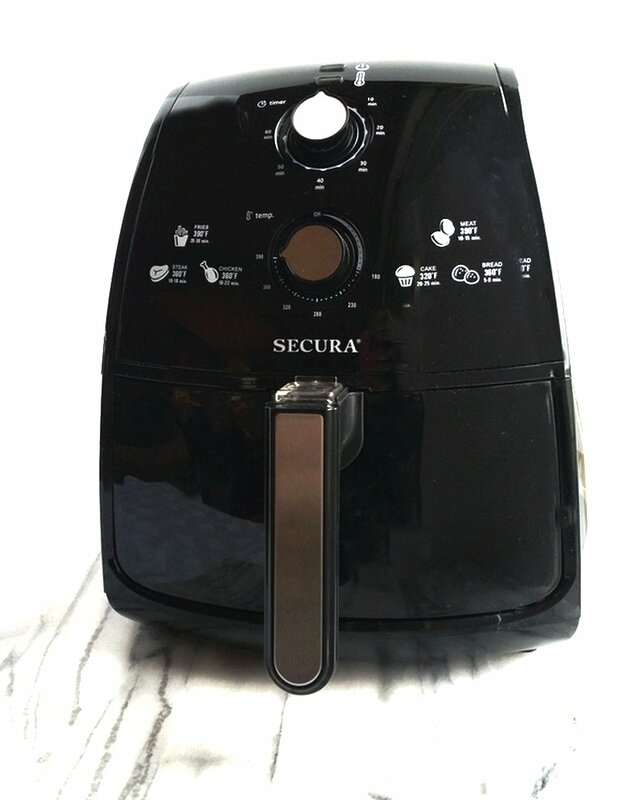 I haven’t used the “secura” air fryer yet. how is it? Salmon in the air fryer is one of my favorites. and thanks for the recipe going to see how it turns out vs. how i’ve been doing it. I was afraid I wouldn’t be able to cook this in my Tefal air fryer because the rotating paddle would break up the salmon, but I simply removed the paddle and it cooked perfectly! 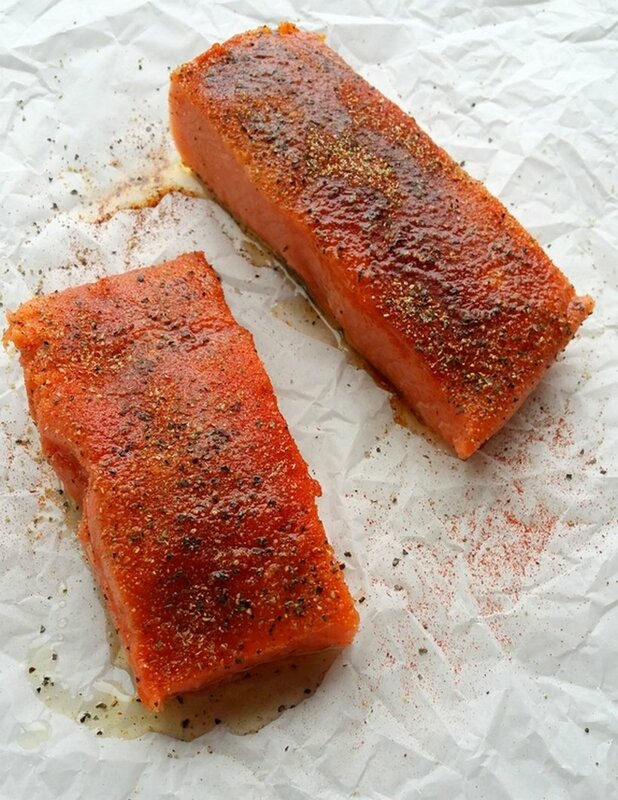 Thanks for sharing the recipe – like you, salmon is going to be on our menu much more from now on! 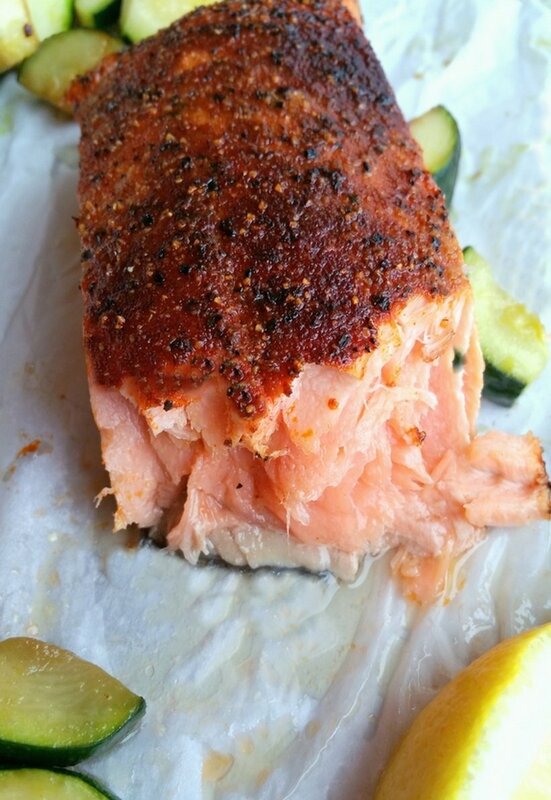 We re still overwhelmed at how quickly and perfect salmon can cook in the air fryer. In fact, almost anything cooked in the air fryer always has come out wonderful. After our air fryer brussels sprouts recipe tests, we started experimenting more with this fantastic way to cook. It s a great way to get dinner on the table, especially for two after a long days work. This looks great! I usually buy my salmon from Vital Choice Wild Seafood in Bellingham, WA (since we live in Boston, MA) and the fillets arrive flash sealed and frozen. I thaw them out in a pot of cold water and that sits in the refrigerator for most of the day. I’ll definitely leave it out for the hour ahead of cooking as you suggested. I could eat this fish raw I like it so much, so the worst thing that could happen to me (which happens with salmon in restaurants most of the time) is for it to come out dry! I look forward to following your postings. My kitchen is tiny and I hate clutter. I buy my air fryer to eat more healthy, not oil, excessive grease, etc. But, even when have to move the air fryer the best recipes are coming from it. The best thing you can do with an air fryer is to jump in and try things. They are very easy to use and the possibilities are endless. This recipe is AMAZING! Will definitely be added to the weekly rotation in our home. I am an avid home cook and this is the best salmon I have ever made. The way the air fryer cooks keeps the fish so moist and delicious. Highly recommend! Thank you! Made the salmon for my son and I tonight. Soo good and moist. Went to get more and he ate the rest. Next time I will make twice as much! 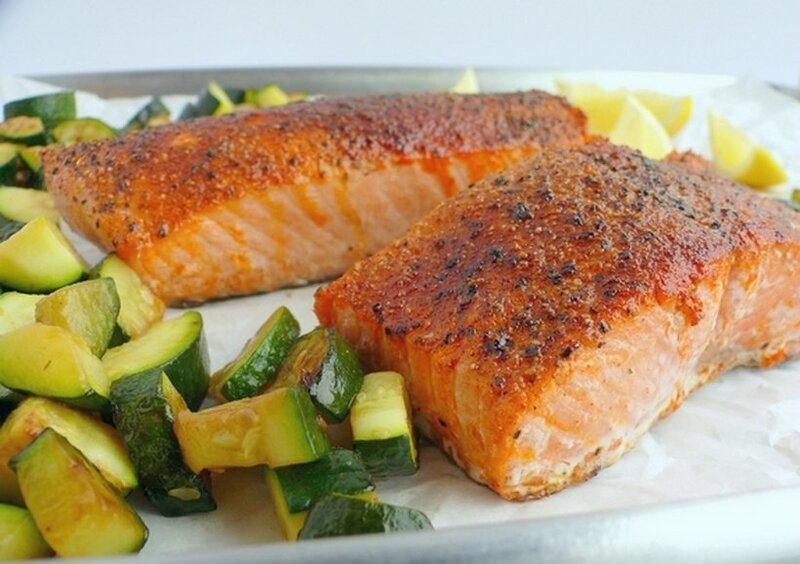 Do you turn the Salmon fillets during cook time? I usually don’t review recipes but I had to tell you my story because you’ve changed my attitude about Bella, my air fryer, completely! I boughtair het when air fryers first became the rage. I didn’t want to invest more than I had to in something I wasn’t sure I’d use so Bella is an entry point girl. No fancy stuff on her – a simple temperature and timer dial is all she’s got. The first thing I made in her was a disaster. It was chicken tenders and I’m not sure what I did wrong, but I’m pretty sure it was everything. Though I’m sure the fault was mine, and not hers, I banished Bella to a dark closet and pretty much forgot about her. In the meantime I purchased an Instant Pot and Bella became just a bad memory. Every once in a while, when I’d spot her gathering dust on the shelf, I’d feel a twinge of guilt and think I should give her a second chance. I did that tonight using your salmon recipe and my faith in the air fryer is renewed. It was delicious – flaky, flavorful, perfect. My husband hates the fishy taste that salmon can sometimes have so I soaked the filets in milk overnight. I cooked the recipe almost exactly as directed, using grapeseed oil to coat the filets and mixing 1 tsp. each of smoked and plain paprika with the salt and pepper to season. We used a pineapple habenero sauce to glaze after cooking. It was devine. Thanks for restoring my faith in air fryer cooking. I can’t wait to try more of your recipes and more air fryer cooking in general! Hi. Thanks for sharing! I tried it and it was good! If i have leftovers. How would you suggest i warm it up to not have the salmon be dry? I microwave it covered, with a tiny bit of water in the dish. It’s never dry. This was the best salmon I’ve ever made! Excellent! Thank you! We’ve made this the past two nights and love it! 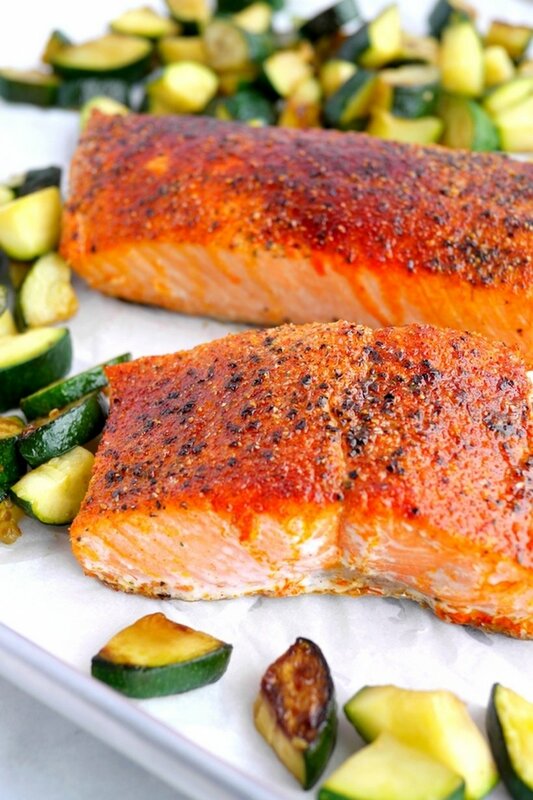 We change up the seasonings, but the salmon is cooked perfectly! My kiddos are inhaling it! Thanks! Will be trying your salmon recipe soon, but a couple I enjoy are to make a mixture of lemon juice (squeeze one lemon) and/or lime juice, and minced garlic and blend it in a small blender to liquify it and then pour it over the salmon filets, then add salt and pepper (I use a smoked chili sea salt combo in a grinder) and let them sit for 30 minutes to an hour before putting them in the air fryer. The other option is to dice up red and yellow peppers and cook them in red wine or an olive oil vinaigrette dressing and add salt and pepper to taste, and then pour that over the salmon and let sit to marinate for 30 minutes to an hour before cooking. Wow amazing recipe, looked like photo and I used cilantro lime seasoning and brushed a small amount of butter on the last two minutes. So good.Thanks for sharing the recipe. Do you have to leave it out an hour before? Does it just take longer to cook if not out? Anytime something is colder, it will take longer to cook. Just keep an eye on it. Wow! This Salmon recipe is the BOMB!😋 Even my picky Granddaughter loved it! I wonder if I can use this cooking method for mahi mahi? I’ve searched for mahi mahi airfryer recipes and they all seem to be breaded and I dont want breaded. I made this tonight for dinner. It was so good I have left overs so I will be taking it to work tomorrow can’t wait to have it. It was so simple to make.